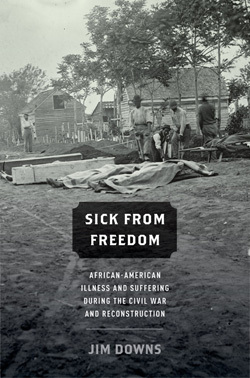 Jim Downs’s new book, Sick from Freedom: African-American Illness and Suffering during the Civil War and Reconstruction , is making somewhat of a splash in the mainstream media. Articles have recently appeared in the New York Times, The Guardian Observer, and Daily Mail. I am reading it now and I can’t recommend it highly enough. It tells an important story that not only adds to our understanding of the challenges and consequences of emancipation, but forces us to step back to evaluate how we as a nation remember the Civil War itself. You might be surprised by the folks who are jumping on the Jim Downs bandwagon. First, we have the Sons of Confederate Veterans, who reprinted the Daily Mail article in its entirety on their blog. They no doubt see this book as supporting the timeless Lost Cause chant that slavery as a system was benign and that slaves would have been much better off in the long term under the care of their masters. And then we have Thomas DiLorenzo at the Lew Rockwell blog, who uses the book to support his view of the Lincoln administration’s ultimate goal of genocide and expansionism on the Plains and imperialism overseas. Finally, we have Richard Williams, who has built his blog around warnings concerning academics like Jim Downs. He, apparently, also likes what he sees. You will not find any kind of analysis of Downs’s actual argument on any of these sites. In fact, I can guarantee you that neither DiLorenzo, Williams or anyone at the SCV will read it. Why? Because they are not interested in historical interpretation. History is little more than competing narratives that must be attacked or defended. What they are looking for is support/vindication of broader political assumptions and/or sacred narrative truths. It’s just hard not to crack a smile when that vindication comes from the community that is regularly condemned by these same individuals. With that, do yourself a favor and read the book. Please. Just because someone disagrees with you, even if they are ignoring the facts that they don’t agree with, doesn’t mean that they will not read the book. Of course, but the fact remains that it is very unlikely that they will read the book. Given how all three approach history it is not necessary that they do so. I was just reading the LRC link, and now I’m curious: is there any truth to the claim that Lincoln wanted to deport blacks up until his dying day? Forester, my recollection from my reading is that Lincoln had given up on the idea of resettling blacks by 1864 or so, but it is certainly true that he supported various colonization schemes until quite late in the game. For most of his political career, Lincoln was a supporter of colonization-resettlement, because he did not think that free blacks and whites could live together. The key thing to remember is that the schemes Lincoln supported were voluntary colonization efforts — not forced deportation. Lincoln also suggested, in his last public address, extending suffrage to at least some freedmen, particularly to former Union soldiers. They were all completely off the map, dealing with unprecedented challenges, and all sorts of ideas were on the table at one point or another. Is it possible to know what Lincoln really thought? My impression from what I’ve read is that from the outbreak of war everything he said in public or on the record was calulated to contribute to victory, which required his re-election and Republican majorities. As he’d got the abolitionists on board by his actions, his words were desigened to keep the support of as many of the rest – “constitutional unionists” etc – as possible. Or is this not so? It’s funny that you made this post Kevin. THE Southern Heritage defender was just explaining the other day how “Sick from Freedom” is useless to you specifically. Just put it in my Amazon cart. So I guess we will see Lucifer as a line mate when Brooks laces up the skates next winter?!?!? Or some New Jersey Devil. She who shall not be mentioned asked me to respond to Tom DiLorenzo’s screed on the book. The answer is simple: if DiLorenzo actually read the book, he’d be guilty of misrepresentation or simple stupidity. That’s what I gather from the comments here. So hell’s frozen over … and guess who finds herself encased in ice? Poor, poor you-know-who, the frustrated fiction writer. What is your take on the number of those that died? I see DiLorenzo places it at 1 million and claims that is the number the book claims. Seems high to me when there were roughly 4 million slaves at the time. What is your take? I haven’t got a copy yet, but a skim in Google preview doesn’t show that claim. It does state (introduction, p. 9) that about a million freedmen received medical treatment through the Freedmen’s Bureau, which Downs considers a “conservative” estimate. That sounds entirely right to me, but it’s also obviously an entirely different claim. The Daily Mail story says that “up to one million died or got sick,” and the NYT says, “at least one quarter of the four million former slaves got sick or died between 1862 and 1870.” Again, not an implausible number, but also not what DiLorenzo claims. Unless there’s something I’m missing, DiLorenzo just tossed that number out there because it’s a gob-smacking, easily-remembered figure, trusting his readers not to bother to fact-check him. You’d think a professional economist would be more careful with numbers, but in this case you’d be wrong. I think the key difference is “died” and “sick.” To lump both numbers together as Andy thinks DiLorenzo did, is inaccurate. Rob – you’re right. I stand corrected. The larger point is that DiLorenzo doesn’t need to worry about fine tuning his language because precision is not his goal. It was enough to take a newspaper review and apply it to his larger assumptions about Lincoln and the Civil War. Rob, you are very correct. However Richard will not make that distinction because that would be academic and Richard hates anything academic. However I do believe out of the three mentioned Richard will most likely read the book. Easy killer. He admitted missing that “lumping” in a comment above. Please, let’s not turn the comments section into Kindred Blood. Note, too, that DiLorenzo attributes that same “as many as 1 million” deaths to just two diseases, when there were many other very serious illnesses running epidemic at the time. Now one can call DiLorenzo willfully dishonest, or simply incredibly sloppy with describing Downs’ findings. But either way, his statement seems to be blatantly, obviously wrong. Seems to be an Economist hat trick to me. Teasing out factors to get the desired outcome. There was a small typhus epidemic post Civil War in select cities as well. The piece was nothing more than another example of DiLorenzo’s tendency to rant. He has never done serious history and he never will because that is not his goal. In the Daily Mail story, Downs properly calls attention to the freezing deaths of soldier Joseph Miller’s family at Camp Nelson, Kentucky following their expulsion from camp. I was immediately reminded of Amy Murrell Taylor’s painstaking examination of that case in Stephen Berry’s Weirding the War. In sum, the Miller story created such a scandal that the Kentucky-born camp commander was fired, the families were allowed to return, Edwin Stanton ordered a shelter erected there for all refugees from slavery, and Congress passed (and Lincoln signed) Sen. Henry Wilson’s bill emancipating the wives and children of Union soldiers. The Miller story is tragic and painful, the transcript grips my students annually, but it was anything but an act of cultural genocide planned in Washington. I was quite surprised to see a news story in the Guardian about this book. I don’t remember a book about the ACW making the news before, and the last one I remember being reviewed was Battle Cry of Freedom. Downs’s publisher must be doing something right.